I named this blog Sprinkled Notes because my mind is sprinkled with ideas and it flits around here and there. You never know what you are going to get when I post on this blog. The problem being a creative person is the fact it is hard to stick to one thing for very long. I have discovered if I hit a block with my writing, it is time to take a few moments to do something else creative. I like to try different things. Sometimes the things I create are successful and other times they are a bomb. Failure with something is fine with me, at least I tried. I was not happy having limited counter space in my kitchen. Contrary to popular belief writers don’t always make a lot of money, and it is feast or famine, so new cupboards were out of the question. 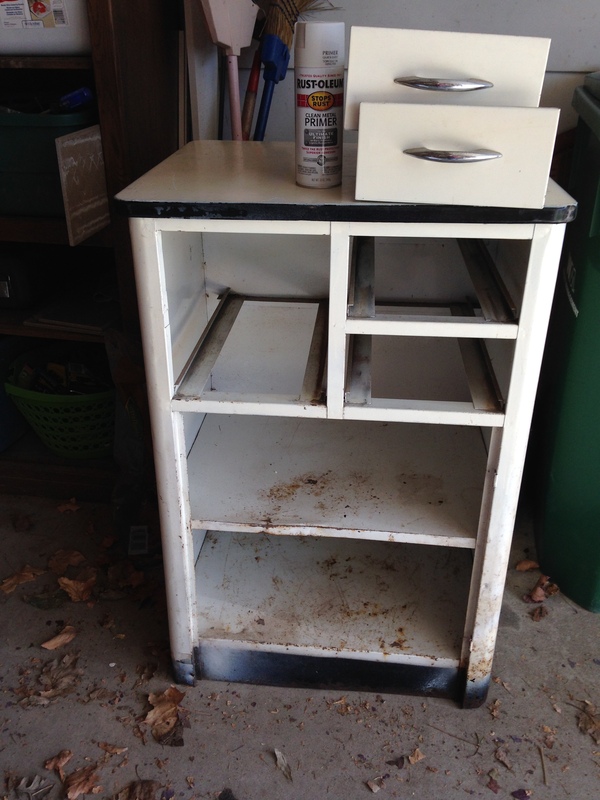 I happened to find a small, old metal, kitchen cabinet that was very rusted. I fell in love with it. It had the porcelain top that matches an old table I had also worked a little magic on. I might add that the ones in my household that like this table is me and my cats. The other person in my household was not impressed with my find, but bless his heart, he let me have fun with the cabinet and he moved the finished product into my kitchen. I don’t know if the way I recycled it was correct but here are the steps I used. 2. Sanded the rust. (Make sure you wear a mask). 3.Scraped the paint off the top that was covering the porcelain. I used a green paint remover. Can’t remember the brand and I threw away the empty bottle. 4. Two coats of Rustoleum primer. 5. Two coats of Rustoleum Gloss Enamel. Make sure you use a mask and let it dry in between coats. Disclaimer: I am not an expert, don’t know if I did it the right way so before doing this you might want to consult someone. I had fun, it is in my kitchen, and I love the breadbox inside of the cabinet. At one time were doors, but they were not with the cabinet but it didn’t matter to me. Previous Blogs, Parties, Giveaways, Granny, Nate, Lisa and Memorial Day, Oh MY! Love it! Great job recycling! Anyone can do it and a crazy imagination helps. Good job Julie! I’m a huge fan of upcycling. Thanks Sandy, It is fun.